(From left, back): Rebecca Fowler, Shelley Morris, Neely Mundell, Richard Stafford, Maria Garcia, Angie Adair, Rob Triplett, Max Busching*, Hunter Murray*, Chance Theriot, Sydney Pinnen, Joy Cloud, Michele Markow (front) Cathy Strauss, Cassie Alston, Jennifer Clark, Katharine Todd, Nancy Kilpatrick, Leslie Waring, Beckie Lewis, Sarah Shaw, Lisa Perkins, Avery Buffington, and Sandra England*. Not pictured: David White. 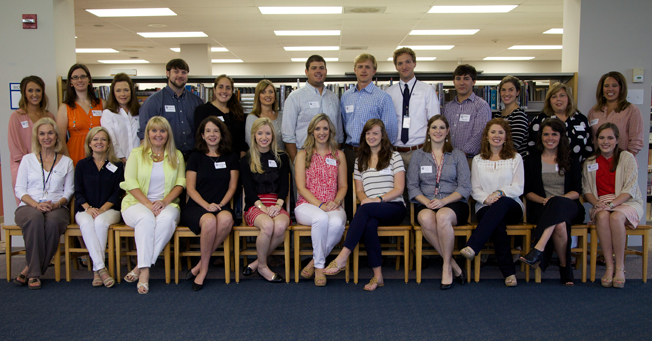 JA is pleased to welcome an outstanding group of new faculty and staff for the incoming year. Representing areas from Preschool to core curriculum and special subjects to support staff, our incoming group brings a wealth of knowledge and experience to complement JA’s already outstanding faculty/staff, curriculum, programs, and services. New employees participated in orientation August 4, with an overview of Jackson Academy academic programs, operations, extracurricular activities, non-academic administrative services, and employee benefits. President Cliff Kling welcomed new faculty and staff, and JA Association President Jan Ishee spoke about the work of the JAA. Faculty members concluded the day in meetings with their divisional deans. University of Mississippi, B.A., M.Ed. Universidad Iberoamericand de Santo Domingo, B.S. University of Mississippi, B.A., M.A., Ph.D.
University of Mississippi, B.A., M.A.